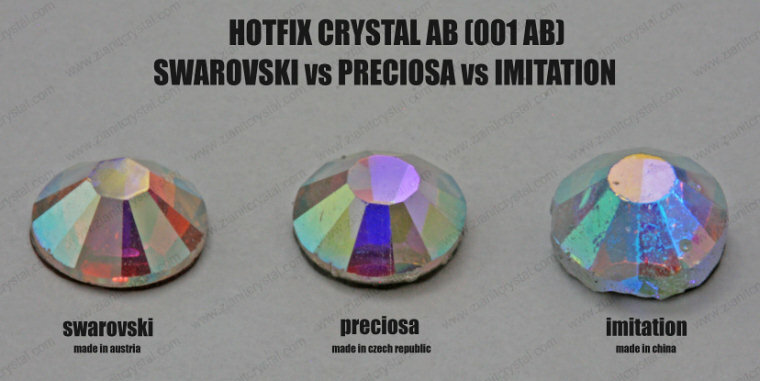 In the previous post, we compare the appearance in between Crystal Color & Crystal AB of Swarovski, Preciosa & Imitation hotfix crystals. To recap we take a photo with about 14 times magnification. It does show the different between them. Swarovski clearly more sparkling & shining than Preciosa. Both of them far better than Imitation hotfix crystal. This time we decide to compare colored hotfix crystals. In hand we have SS20 Light Amethyst hotfix crystals for each Swarovski, Preciosa & Imitation hotfix crystals. From our naked eye, we can’t see the different in between Swarovski & Preciosa but easily differentiate the imitation crystal due to poor surface finishing & sparking. Before jumping to any conclusion, we need to point out that the color for Light Amethyst Preciosa hotfix crystal is a little bit darker than Swarovski & Imitation to avoid misjudgment. You can see it clearly in the photo above. By comparing Swarovski & Preciosa, it is very hard to find any different between them. Both of them, the cuttings are precise & sparkle. It is worth using Preciosa crystal as you only have to pay a fraction of Swarovski price. However, for the imitation hotfix crystal, you can see clearly the cutting & surface finishing are poor. The crystal not sparkling as good as Preciosa or Swarovski. Both Swarovski and Preciosa crystals are available at Zianit Crystal shop. Ever wonder why Swarovski Hotfix Crystals are so expensive? The main reasons are Swarovski Crystal sparkling the most & the cuttings are very precise. How about Preciosa Hotfix Crystals which claim to be the second? How about cheap imitation hotfix crystals from China? Let’s compare them by putting them side by side. Through naked eyes, we can’t see the difference but due to its size, we can see it very clearly. We decided to make it more dramatic by producing images with 14 times magnification. To do this, we have to set up proper equipment to capture the images. You can see clearly the Swarovski sparkles the most & the cuttings are very precise. The quality of Preciosa is very good too although not as good as Swarovski. China-made imitation crystal, however, shows the worst quality in terms of the sparkle and cutting. Being the highest quality, of course Swarovski is the most expensive crystal in the market. However, we believe Preciosa crystals are the best substitute over Swarovski and more affordable. Why Hotfix Crystals Stuck on the Tip of Hotfix Applicator?